The Stone Coated Steel Solution. Here's what you need to know about this metal roofing system. Even today, many home and building owners are uninformed—or, even worse—mis-informed about metal roofs. However, stone coated steel is not your typical metal roof. Stone coated steel roofing systems are offered in a variety of styles that can compliment any home or building. Available in daring splashes of color, flaunting classic contours and traditional styles, stone coated steel roofs are becoming more visible on residential and commercial building exteriors. Its strong composition allows it to withstand the elements, but its elegant aesthetic appeal satisfies even the most refined tastes. Stone coated steel has made its mark in the roofing industry and continues to offer progressive advantages and benefits to homeowners. Well suited for both new construction and renovation, here is what contractors and homeowners should know about stone coated steel. COMPOSITION The composition of stone coated steel roofing systems varies by manufacturer. DECRA Roofing Systems Inc. ( Corona, CA), the manufacturer of the original stone coated steel roofing systems, manufactures its roofing panels with several protective layers. The panels are made from structural grade steel. To enhance the corrosion resistance of the steel, it is coated with aluminum-zinc alloy or zincalume. The zinc works exceptionally well in protecting exposed areas such as custom cut edges and drilled holes, and extends the corrosion resistance of the underlying steel. The aluminum-zinc alloy coated steel has an acrylic coating that is applied to both sides. This acrylic priming system provides a uniform substrate that enhances the adhesion of subsequent coatings. Next the panel is pressed into shape and a base coat of acrylic resin is applied. This specially formulated coating is made in two colors that blend with the various stone granule colors. The base coat serves two functions. It provides the adhesive to bond the stone granules to the steel substrate, and it also protects the underlying material from moisture and UV light. Pure acrylic resin, the strongest polymer capable of being made into a water-based paint, provides optimum UV resistance. To add an attractive finish and provide extra protection, ceramic coated stone granules are applied to the panels. These granules improve the resistance to UV light and ensure maximum coverage of the basecoat. "The stone granules further protect the steel from the elements and make the tiles aesthetically appealing," said Bo Hudson, president of DECRA Roofing Systems. Finally, to complete the composition of the stone coated steel roofing, an acrylic overglaze is applied on the granules to give the panels a semi-gloss appearance. This tough, thin, acrylic finish bonds to the granules and encapsulates them with a coating that provides extra protection. STRONG AS STEEL Stone coated steel roofing systems have a signature trademark for being strong enough to perform exceptionally well under the elements. Hail, wind, fire, freeze/thaw and even earthquakes challenge roof systems, but stone coated steel's capabilities give it an extra edge against Mother Nature. Many stone coated steel roof systems are also supported by a 50-year warranty. HAIL This phenomenon causes widespread concern among contractors and homeowners. Large hail stones can penetrate a roof creating golf-ball sized holes, and has the potential of completely destroying a home's exterior. "The average yearly wind/hail loss involving roof damage for the insurance industry is $1.6 billion," said Ron Bacon, loss and mitigation administrator for State Farm Insurance. Each roof system has its strong points, and stone coated steel is a prominent leader for its hail resistance. Available with the highest hail rating, UL 2218 Class 4 impact resistance, stone coated steel has survived some of the worst hailstorms that have swept through the country. "Homes in the Dallas area experienced major hail damage in 2003," said Bacon. "As the largest insurer in the nation, State Farm Insurance had over 500 policy holders in that area with Class 4 roofs; none of those were damaged, avoiding a $2 million loss. Manufacturers have qualified homeowners for insurance premium discounts since the beginning. DECRA offers a Class 4 hail rating, which offers the largest premium discount." EARTHQUAKES Although California is notorious for having earthquakes, they have shaken things up in areas you may not think of, such as New Hampshire, Alaska, Alabama and even Minnesota. A decade ago, a report was conducted by The McMullen Company Inc., which rated the performance of roofing materials after the 1994 Northridge, CA quake. They found that the roofs with the least damage were made of stone coated steel. Out of the 122 buildings that were analyzed in Northridge, 93 featured concrete or clay tile roofs, 17 featured stone coated steel, eight featured wood shake roofs and four featured asphalt shingles. Despite the horrific damage the earthquake caused, the stone coated steel roofs had little structural or roof damage, even in areas of significant destruction. Concrete and clay roof systems displayed the most severe damage, followed by wood shake and asphalt roofing systems. FIRE RESISTANCE Aside from roofing options such as wood and asphalt, stone coated steel roofing is a UL-Class A fire rated material, the highest fire rating in the industry. With the devastating effects of fire, stone coated steel's strong resistance to fire is an exceptional benefit that could save homes and commercial buildings from destruction. WIND RESISTANCE Stone coated steel has the ability to withstand hurricane force winds, making it ideal for coastal areas, as well as other regions that are exposed to harsh weather conditions. Although it works well in coastal areas, high winds can strike almost anywhere. Wind warranties for stone coated roofs can be as high as 120 mph. Many stone coated steel roofing systems also use interlocking panels and unique horizontal fastening methods that are usually not an option with other roofing materials. FREEZE/THAW CYCLING Water often pools on the roof near cracks and fractures. The freeze thaw cycle eventually allows that water to penetrate the roof and then the attic, walls and ceilings. Freeze/thaw and ice damming are major concerns in northern climates, but they can be prevented with the right roof system. While other tiles are prone to cracking, splitting and breaking from the strain that this natural climatic change causes, stone coated steel has a non-porous surface, allowing it to resist freeze/thaw cycles. A LIGHTWEIGHT ALTERNATIVE Although durability is typically accompanied by heavy weight characteristics, such as with slate roofing, this is not the case with stone coated metal roofs. This makes it easier for the contractor to install and puts less stress on the roof deck and structure. Weighing a mere pound and a half per square foot, stone coated steel is lighter than wood shakes, concrete or slate. "Stone coated steel roofing products avoid adding extra weight to the trusses, are safer in fires and earthquakes and allow easy installation," said Tony Tiapon, zone manager for DECRA Roofing Systems. "The lightweight properties benefit the home, the homeowner and the contactor." Unlike conventional roof systems, a major benefit of stone coated steel roofing systems is that it can be installed over most existing roofs, offering substantial time and labor savings. DECRA Tile, Shake and Shingle Plus can also be installed using a batten system. Rather than laying individual tiles, shake or shingles one at a time, larger modular sections are laid and securely locked into one other. The batten spacing is measured from the front of the batten to the front of the next batten as installation progresses to the ridge of the roof. The application features a staggered method that avoids tracking panels up the roof and allows more coverage area and a stronger installed system. "There's only 20 shingles to a square, there's a much larger coverage area, resulting in less fasteners and less labor expense," said Keith Lyles, president of Classic Superoof in Ft. Worth, TX. The panels should be applied two courses at a time and then securely fastened. Special considerations when installing stone coated steel on a batten system include: bending the panels prior to cutting for the last course at the ridge; always form the batten around penetrations; adjust battens at the ridge for roof pitch—narrow for steep pitches and wider for lower pitches—and paint pipes and flashing prior to installing panels. CURB APPEAL If thoughts of corrugated, red, shiny metal roofs come to mind, it's time to embrace the new generation of metal roofing. "Stone coated steel looks great for years," said Randy Perkins a homeowner in Abilene, TX. 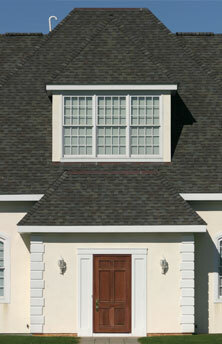 "I have the DECRA Tile roof system on two of my homes and I love the look of it. They offer a design and color for any kind of home." The different profiles can emulate contemporary clay tiles, traditional asphalt shingles and even natural cedar shake. Both residential and commercial steep slope roofing applications have never looked so good in metal. The array of colors that stone coated steel roofing systems offer can add a unique element to your next roofing project.